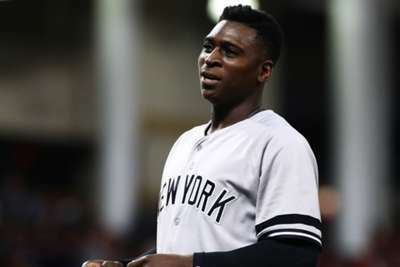 New York Yankees shortstop Didi Gregorius could be heading to the disabled list with a bruised heel. Gregorius suffered a "pretty significant" heel bruise in the Yankees' 10-2 win over the Toronto Blue Jays on Sunday, New York manager Aaron Boone told The Athletic. Boone said Gregorius could end up on the DL after the 28-year-old was taken to hospital for further tests. "Not great," Boone said. "There is nothing broken or anything like that, but he's got a pretty significant bruise, and there is some swelling in there." The injury occurred when Gregorius collided with Toronto first baseman Kendrys Morales while attempting to beat out an infield single in the first inning. Gregorius remained in the game but was removed before the start of the third. He has registered a .268/.332/.481 slash line in 117 games for the Yankees this season. He has also hit 22 home runs and tallied 73 RBIs.